House of Tallulah is a cafe in Alice Springs. Two streets from the main drag. Two streets from foot traffic in a town of thirty thousand, it relies entirely on patronage by people who know where it is and what they’re looking for. Most are looking for the same thing. Along with the usual caffeinated beverages and baked artisanal treats, House of Tallulah is the only cafe in Alice Springs, possibly the only cafe in the northern territory of this great southern land, that also serves directions. I’d arrived in Alice a few days earlier. Fourteen hours by bus from Arnhem. I was hungry for professionally prepared food and thirsty for a varied blend of civil refreshments. My friend Reuben picked me up. He's a cowboy - but he doesn’t ride horses. He plays chess. Which isn’t to say he lacks any of the rugged qualities for which cowboys are known. Reuben combines practical knowledge of the task at hand with an eye for craftsmanship, sense for adventure, stylish garb and a cracking wit. We grew up either side of the same leafy street in suburban Perth. Reuben introduced me to Bob Dylan, Simon and Garfunkel, Crosby, Stills, Nash and Young. Fifteen years later he sent me to visit House of Tallulah. “Ask for directions,” he said. 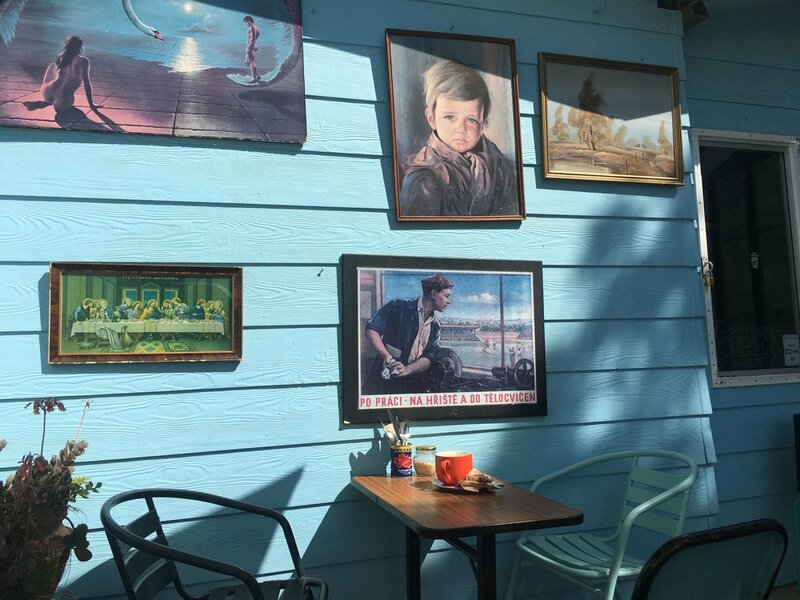 The cafe operates from a powder blue weatherboard bungalow set back thirty paces from the street. Framed portraits clad the bungalow in Christian iconography and idilic scenes from turn of the century rural dreams. A concrete footpath leads to a single front door. To the right of the path is a tall whitewood. To the left is a patch of verdant lawn large enough for two cars. The eight alfresco settings are composed of odd vintage chairs and makeshift coffee tables. Cutlery stands in salvaged tins of diced tomatoes next to short stacks of recycled paper napkins. Everything, the portraits and weatherboards, the lawn and tree, the handfuls of creamy white blossoms cast across the path by gusts of spring wind, everything is stonewashed in desert glare. House of Tallulah is a cafe in Alice Springs. I walked inside, into a long rectangular room with a bench down one side. On the bench was a coffee machine and cash register. Also a glass cake stand full of blueberry muffins and ready-to-toast breakfast sandwiches. A doorframe at the back of the room led to a stainless steel kitchen and at the back of that another doorframe with a beaded curtain. Behind the bench stood three women. On the right was Liza, five-five and forty something with curly black hair, full eyebrows and leathery skin made soft by beauty cream. She wore an assortment of chains around her neck and a red silk singlet. From one of the chains hung a kookaburra’s tail feather. Her wrists were stacked with bangles and beaded bracelets and she wore a single pendant earring, a three dimensional plastic moon. On the left was Charlie, cropped grey hair and a four inch mohawk. She wore a silver ring on her right thumb and her square frame was dressed in ripped Levi’s and a tight grey t-shirt printed in bold texan typeface with the words ’NO COUNTRY FOR OLD MEN’. Between Liza and Charlie, taller by a whole two feet, stood Tallulah. Everything about her was exaggerated. Her saucer-sized eyes were wide set and filled to the brim with coffee brown. She had high cheek bones and ears like conch shells. They poked through shards of maple hair that fell beside her neck and grazed her clavicles. The neckline of her camel blouse stretched shoulder to shoulder and sat low enough to reveal the creases in her underarms and a few curly maple hairs. It was embroidered with small candlesticks in threads of red and purple. They spread over her bust and cascaded to her midriff where her blouse was cut short and showed the olive skin of her belly. An oversized ruby pendant dangled from her bellybutton. Beneath that was a forest green chiffon skirt and a pair of cradled hands. Her wrists were tattooed with black and grey bands ranging from one to four centimetres. They ran all the way to the middle of her upper arms. Each a patterned mix of cross-hatch, swirls and strange letters in alien script. She wore pendant earrings, one of which was a three dimensional plastic moon. The other was a birthday candle. “What can we get you?” said Liza, with a smoker’s voice, rasped by inflammation at the back of her throat. I blinked - lost for words. Liza cocked her head. The thick mascara around her eyes crumpled with hints of scepticism. I turned to Tallulah. She was smiling impossibly wide, when she blinked back I swear I heard her lids collide. “Um,” was all I could manage. “Coffee?” asked Tellulah. Her voice was high pitched and playfully sarcastic. “Um,” I mumbled. The game was finished. Tellulah glanced at a clock on the wall behind my head. It had a porcelain face and black enamel roman numerals pointed to by plastic candlesticks. Ten o’clock. “Perfect,” she said and stepped back, moving towards the end of the room and out from behind the bench so that she stood facing me. I looked at her bare feet. Each finger-length toe wore a gold band set with a different coloured crystal. I stared long enough to consider the shape and colour of each one. Tallulah watched me. She lifted her toes and gave them a wiggle then set them again on the floor. I looked at her face. I though she was about to laugh. But instead she blinked and said, “Come on, sweetheart.” Then she turned and disappeared into the kitchen. I started after her but was cut short by a tap on my shoulder. It was Charlie. “Works best if we get this out of the way,” she said, calmly handing me a laminated piece of A5 recycled paper. At the top, in bold purple print was handwritten the word ‘Directions’. Under that, in the middle of the page, was written ‘$120’. “Um,” I felt in my bag for my wallet and pulled it out. Charlie was holding a wireless EFTPOS machine. I typed my four-digit PIN and pressed ‘Okay’. Transaction approved. I walked in. All of the characters and events in this story are fictional.